An electrode has been developed based on using a composite of hematoxylin/graphene/ZnO nanocomposite to modify a glassy carbon electrode (GCE). The electrode (HGGCE) was tested and found to be applicable for the voltammetric analysis of levodopa in the presence of vitamin B6, theophylline and guaifenesin using a 0.1 M phosphate buffer solution (PBS) pH 7 as the solvent. The HGGCE was used as the working electrode in cyclic voltammetry (CV) and square wave voltammetry (SWV) studies on the electrochemical behavior of levodopa at its surface. The results showed a dramatic enhancement in the oxidation current of levodopa and a shift in its oxidation potential towards more negative potentials as opposed to identical tests using bare GCE as the working electrode. The studies showed that the increase in the oxidation current has two linear profiles in two concentration ranges of 0.05 – 90.0 and 90.0 – 1000.0 μM. The detection limit of SWV analysis using the modified electrode was determined to be 0.03 μM (S/N = 3). Further advantages of the methods based on HGGCE include the simple modification procedure of the electrode, as well as its excellent sensitivity and reproducibility. 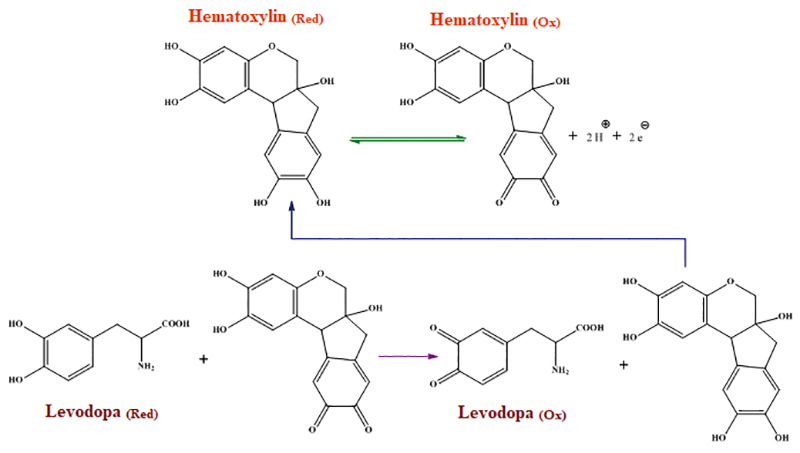 The modified electrode was eventually found to be applicable to the determination of mixtures of levodopa, vitamin B6, theophylline and guaifenesin in real samples. Exosomes are of increasing research interest because they are integral to cell–cell communication and are implicated in various disease states. Here, we investigated the utility of using an ion-depletion zone in a microfluidic device to concentrate exosomes from the culture media of four types of cell lines. 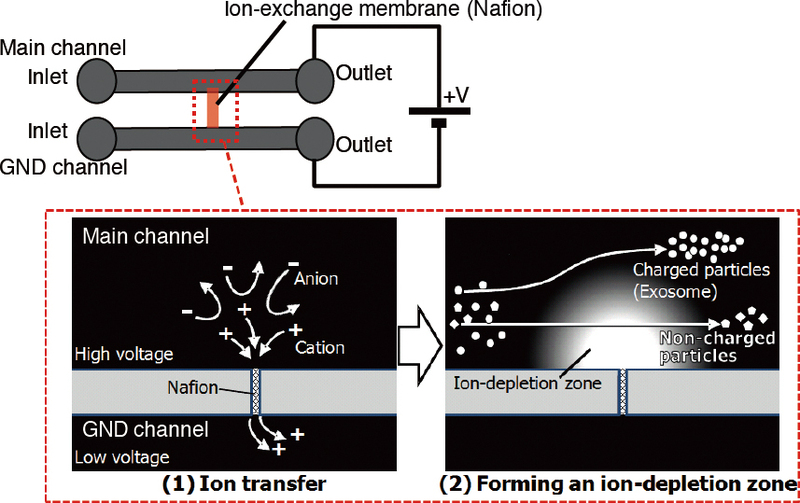 Furthermore, we evaluated the extent of damage to the exosomes following concentration by an ion-depletion zone microchannel device compared with exosomes concentrated by a conventional ultra-centrifugation technique. Our results conclusively demonstrate that significantly less damage is incurred by exosomes following passage through and concentration by the ion-depleted zone microchannel device compared to concentration by ultra-centrifugation. Our findings will help extend the utility of exosomes to various applications. The interaction between thrombin binding aptamer (TBA) and thrombin (TB) was studied by resonance Rayleigh scattering (RRS). In neutral medium, TBA is present in a balanced form between a G-quadruplex structure and a random coil structure, and the TBA can be induced by metal ions to form a G-quadruplex structure. Upon addition of thrombin, the G-quadruplex selectively bound to TB, which resulted in enhanced resonance Rayleigh scattering. The scattering intensities increased proportionally with the concentration of TB from 10 to 50 nM. The method had very high sensitivity and good selectivity, and the detection limit (3δ/s) was 1 nM. In this work, the spectral characteristics of RRS, the optimum conditions of the reaction, and influencing factors for the RRS intensities were investigated. Furthermore, the structure of the TBA-TB complex and the sensing mechanism were explored. The TB sensor was applied to a diluted human serum sample with satisfactory results, indicating the potential of this method to be applied to biological samples. A selective and simple RRS sensor for the detection of trace amounts of TB is proposed based on conformational change of TBA. 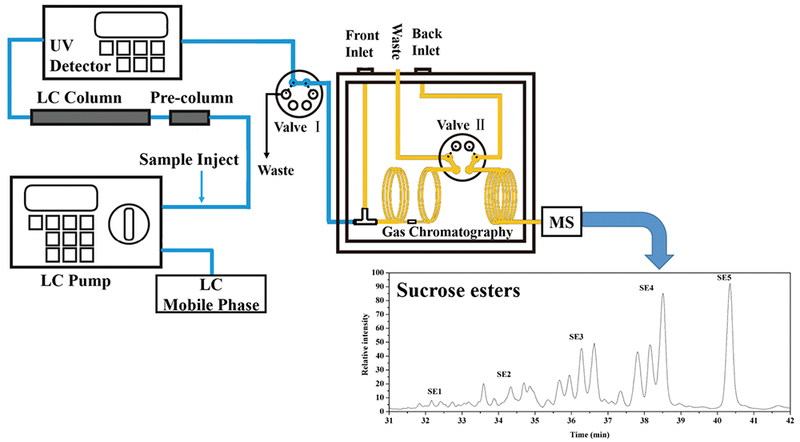 In this work, a strategy of in-series combination of ultrasound-assisted extraction and online LC-GC/MS was constructed for effective separation and analysis of sucrose esters in tobacco. Sucrose esters were first extracted by ultrasound-assisted extraction with high efficiency and easyhandling. Online LC-GC/MS was then applied for sucrose ester clean-up and analysis. To better evaluate the effectiveness of this strategy, we limited our focus to five groups of sucrose ester isomers. Each group differed in mass from the next by 14 Da. The obtained coefficient of the calibration curve was 0.9986. Limit of detection (LOD) and limit of quantitation (LOQ) were 0.05 and 0.16 μg/ mL, respectively. The recovery was above 90% and the reproducibility was below 4%. This strategy was subsequently applied to the comparison of relative amounts of five groups of sucrose esters extracted from three different parts of aromatic tobacco. The satisfactory performance indicated that this strategy has great prospect for the rapid and high-throughput analysis of sucrose esters in tobacco. Okadaic acid (OA) and saxitoxin (STX) are typical toxins of diarrhetic shellfish poisoning (DSP) and paralytic shellfish poisoning (PSP), respectively, which are highly toxic marine toxins threatening human health and environmental safety. OA is a potent inhibitor of serine/threonine protein phosphatases that can cause cellular death, while STX is an inhibitor of sodium channel that can lead to neurological damage. In this work, a dual functional cardiomyocyte-based biosensor was proposed to detect DSP and PSP toxins by monitoring the viability and electrophysiology of cardiomyocytes. The results showed that the viability of cardiomyocytes was sensitive to the OA and STX, resulting in significant changes of the electrophysiological properties, including amplitude, firing rate and duration of the extracellular field potential (EFP). The detection limits of the hybrid-biosensor are as low as 7.16 ng/mL for OA and 5.19 ng/mL for STX. In summary, all of the results indicate that the dual functional cardiomyocyte-based hybrid-biosensor will be a promising and utility tool for shellfish toxin detection. 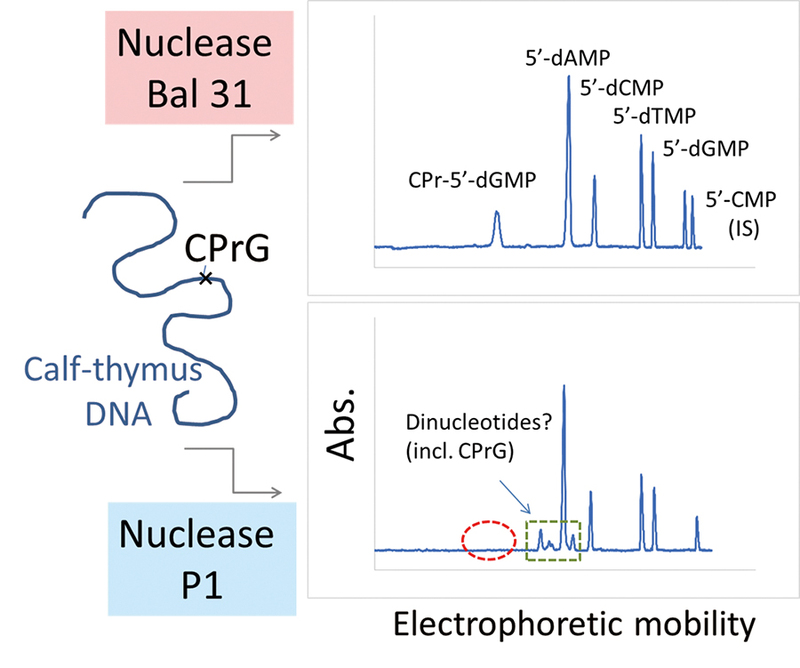 The substrate selectivities of three endonucleases were studied quantitatively using capillary zone electrophoresis to find one giving N2-ethyl(Et)-2′-deoxyguanosine-5′-monophosphate (5′-dGMP) and cyclic 1,N2-propano(CPr)-5′-dGMP from DNAs damaged by acetaldehyde (AA). Six 2′-deoxyribonucleoside-5′-monophosphates to be quantified in the hydrolysis solutions of DNAs, namely, Et-5′-dGMP, CPr-5′-dGMP, and four authentic ones, were completely separated using a 100 mM borate running buffer solution having an optimized pH of 9.67. Using the present method, nuclease reactions of nuclease S1 (NS1), nuclease P1 (NP1), and nuclease Bal 31 to 2′-deoxyribonucleoside-5′-monophosphates from damaged Calf thymus (CT-) DNAs were monitored. The CT-DNAs were prepared by treatment with AA to generate Et-guanine or CPr-guanine internally. Bal 31 hydrolyzed the damaged CT-DNAs to yield Et-5′-dGMP and CPr-5′-dGMP quantitatively. The two 5′-dGMP adducts were not detected in the hydrolysis solutions using NS1 or NP1. Bal 31 can be a suitable nuclease for analyzing DNA damages caused by AA. 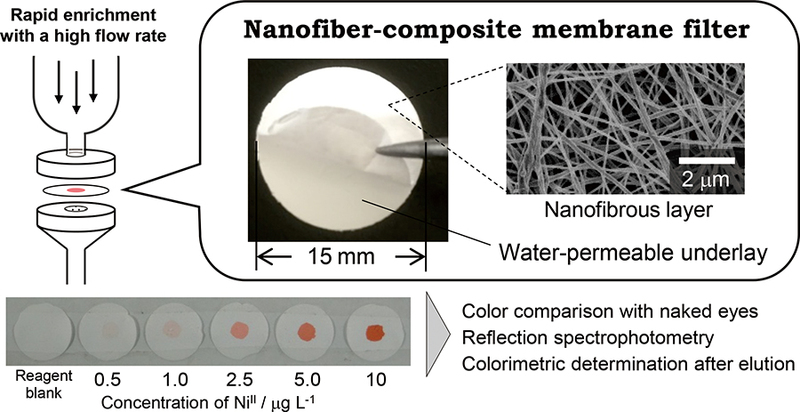 A new method for the rapid enrichment and highly sensitive determination of nickel ion has been developed by using a nanofiber-composite membrane filter, which was fabricated by stacking a nanofibrous material made of nylon 6 over a water-permeable membrane filter. The noncharged nickel-α-furil dioxime complex was adsorbed on a nanofibrous layer of the membrane filter under significantly higher flow rates than those used for conventional solid-phase extraction techniques. Highly sensitive determinations with detection limits at sub-parts per billion levels were achieved by enrichment from 50 mL of the complex solution, and the enrichment was completed within 3 min. The color that was developed on the membrane filter was successfully subjected to visual colorimetric analysis and quantitative determination by solid-phase spectrophotometry. In addition, colorimetric determination was feasible with a handheld spectrometer after elution of the colored agent with 50 μL of acetone. This combination of rapid enrichment and spectrometric measurement in a small-volume sample provides a useful analytical method suitable for on-site analysis, which requires neither expensive instruments nor high laboratory skills. 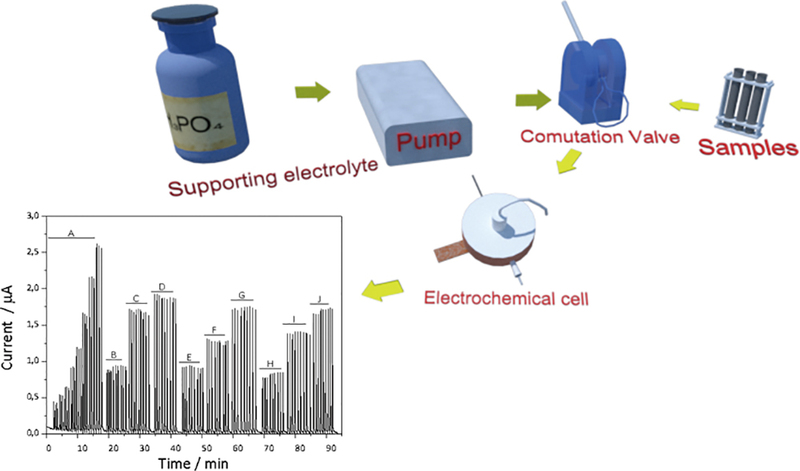 The aim of this work was to develop an electrochemical cell and a methodology based on an amperometric determination of hydrogen peroxide in whitening gel samples under a boron-doped diamond electrode using flow injection analysis. Different parameters were evaluated to obtain the best conditions of analysis: among them, the flow of electrolyte at 2.8 mL min−1, the loop sampling 175 μL (28.5 cm), an analytical length of 159 μL (25 cm) and an applied potential of +0.60 V vs. Ag/AgCl(sat). The proposed method was suitable in terms of precision of results (RSD <10%); the accuracy was confirmed in the analysis of the gels through addition and recovery studies with results between 74 and 107%. The method was then applied to the analysis of tooth-whitening gel samples, acquired in different cities of the region. Regarding the results, a medium concentration value of 2.39% (w/w) was observed. The standard Gibbs energy of ion transfer at the 1,2-dichloroethane/water interface (ΔGtr°,W→O) was determined for 26 organic cations and 24 anions by means of ion-transfer voltammetry with a micro oil/water interface. 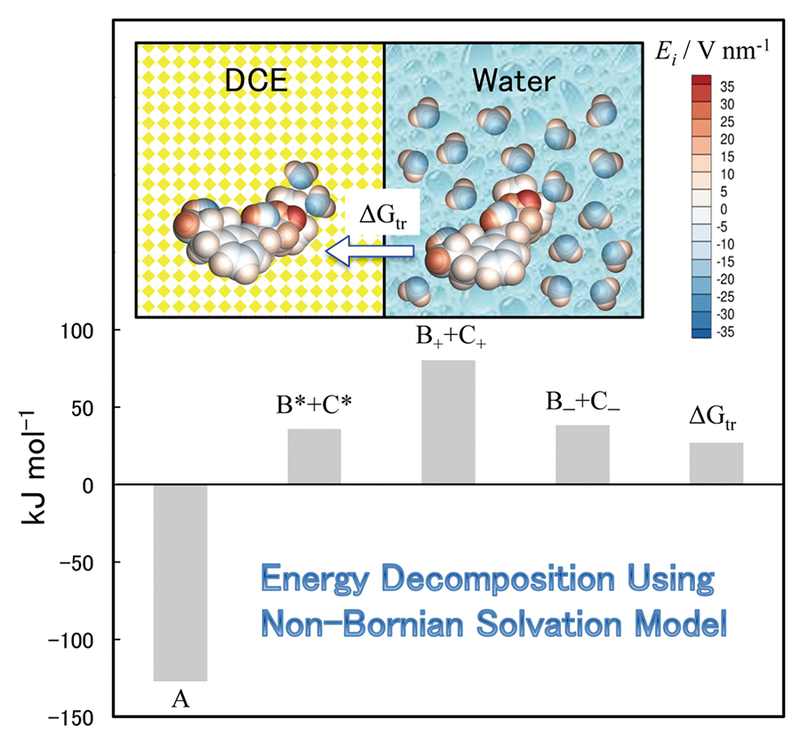 Based on the data sets, a theoretical analysis was performed with the non-Bornian solvation model, in which the solvation energy of an organic ion is evaluated from local electric fields on the surface of the ion. The semi-empirical equations thus obtained are available for relatively accurate prediction of ΔGtr°,W→O for organic ions. The mean absolute error was 1.9 or 3.1 kJ mol−1 for cations or anions, respectively, corresponding to the error of ∼20 or ∼30 mV in the standard ion-transfer potential. In this paper, energy decomposition has been performed to discuss different contributions to ΔGtr°,W→O from the “hydrated” (strongly charged) and positively and negatively charged “non-hydrated” (moderately charged) surfaces as well as from the hydrophobic interaction (cavity formation energy). We have developed a method for the determination of Cr(VI) and Cr(III) in industrial wastewater by liquid chromatography–inductively coupled plasma mass spectrometry (LC-ICP-MS) combined with a chelating pretreatment with 2,6-pyridinedicarboxylic acid (PDCA). The PDCA unified the chemical forms of the Cr(III) species in water samples by the formation of a stable Cr(III)-PDCA complex, which was then separated by a LC column. The chromatographic mobile phase at neutral pH and the column of a mixed-bed of anion and cation exchangers successfully separated not only the chromium species without any redox conversion, but also chloride, which interfered with ICP-MS detection. The method detection limits measured at m/z 53 were 0.66 μg of Cr L−1 for Cr(III) and 0.74 μg L−1 for Cr(VI) with a sample injection volume of 20 μL under a no gas mode. The recoveries of spiked Cr(VI) at 50 and 500 g L−1 into the fifteen kinds of industrial wastewater samples were satisfactory (>90%). The proposed method for the determination of Cr(VI) was also validated by comparing with a colorimetric method using 1,5-diphenylcarbazide prescribed by the ISO 11083 and the JIS K0102. In this work, umbelliferone, a kind of coumarin derivative, was proved to exhibit peroxidase-like activity that could catalyze the oxidation of 3,3′,5,5′-tetramethylbenzidine (TMB) in the presence of hydrogen peroxide to generate a blue-colored oxide (oxTMB). The catalytic mechanism is similar to that of native enzymes (e.g. horseradish peroxidase, HRP) and nanozymes, which follow the Michaelis–Menten kinetics behavior. Meanwhile, the 7-hydroxyl group of umbelliferone plays a significant role in the peroxidase-like activity. Compared with enzymes and nanozymes, this small molecular mimic enzyme possesses the advantages of low cost, simple molecular structures, small molecular weight and high stability against harsh conditions. Based on the favorable peroxidase mimetic activity of umbelliferone, a convenient, practical and sensitive H2O2 and glucose detection method was successfully established. This work not only opens some new inspirations into seeking for novel molecular enzyme mimetics with excellent catalytic activities, but also provides promising assays for clinical diagnosis. We have attempted to detect electrically neutral substances by ion-transfer voltammetry at an interface between two immiscible electrolyte solutions (ITIES), such as an interface between water and 1,2-dichloroethane (a W/DCE interface), by irradiating the interface with ultraviolet light (200 – 300 nm). In the present work, while considering the facts that p-phenylenediamine derivatives are soluble in DCE, but insoluble in water, and that cation radicals of the derivatives are fairly stable in various media, we photoionized the derivatives in a DCE phase by ultraviolet irradiation, and after that carried out ion-transfer voltammetry at a W/DCE interface. As a result, we could successfully observe ion-transfer waves of cation radicals of the derivatives from the W to DCE phase. 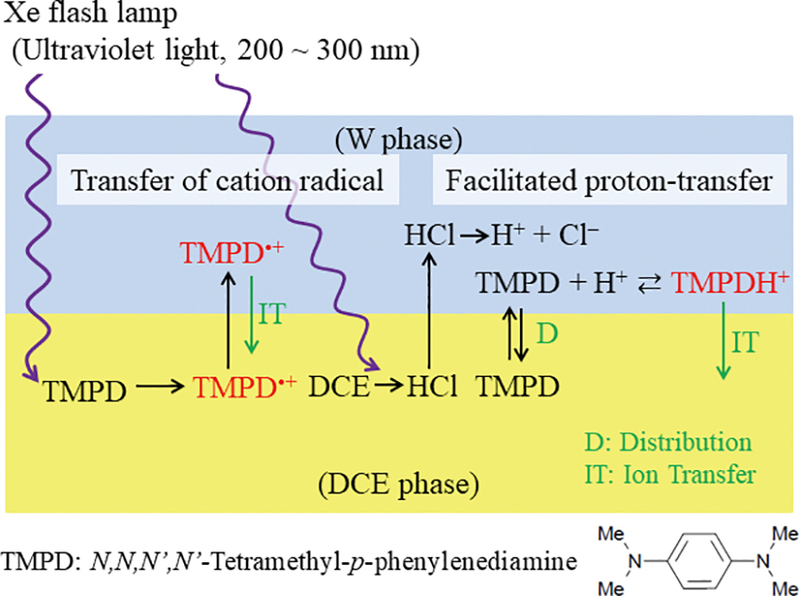 Namely, the cation radicals are generated in the DCE phase by ultraviolet irradiation, and subsequently distributed into the W phase. In addition to these ion-transfer waves, we also found that facilitated proton-transfer waves by the derivatives were shifted to a more negative potential region after ultraviolet irradiation, because of hydrogen chloride formed from photodecomposition of DCE by ultraviolet irradiation. ε-Poly-L-lysine (εPL) is a homopolymer of L-lysine residues with linkages between the α-carboxyl and ε-amino groups. εPL exists as a polycationic species under acidic and neutral conditions, and can form a polyion complex with negatively charged glucose oxidase (GOx). We previously reported that εPL significantly promoted a GOx enzymatic reaction using ferricyanide ion ([Fe(CN)6]3−) as the oxidant. Here, we construct a GOx-immobilized electrode using εPL and glutaraldehyde, and show that [Fe(CN)6]3− can efficiently act as the mediator in this electrode. Ferricyanide ion failed to function adequately as the mediator when bovine serum albumin or other polyamines (e.g., polyallylamine, α-poly-L-lysine) were used instead of εPL. The GOx-immobilized electrode using εPL successfully responded to glucose even when the [Fe(CN)6]3− concentration was as low as 1 mM, and exhibited a wide dynamic range of up to several tens of mM. Thus, εPL is considered to be a useful additive for glucose sensors based on the [Fe(CN)6]4−/3−-mediated GOx catalytic current. Polyethylene glycol/dextran mixed solution as an aqueous two-phase system was fed into a fused-silica capillary tube under different conditions, resulting in phase transformation leading to phase separation multi-phase flow through/along a liquid–liquid interface. 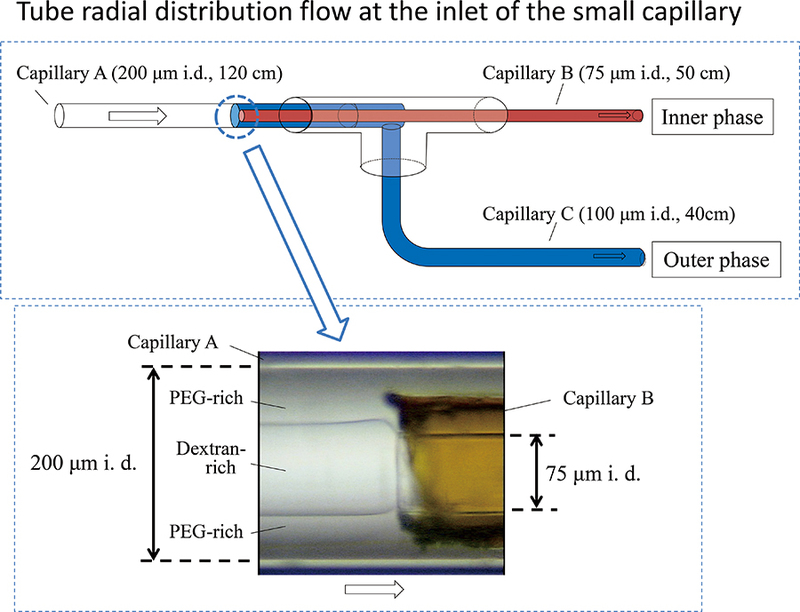 As one flow-type example, when 6.4 wt% polyethylene glycol and 9.7 wt% dextran aqueous solution containing 1.0 mM Rhodamine B was fed into the capillary tube at 3°C, tube radial distribution flow (annual flow) was observed through bright-field microscopy. Tube radial distribution flow consisted of a dextran-rich inner phase and polyethylene glycol-rich outer phase. 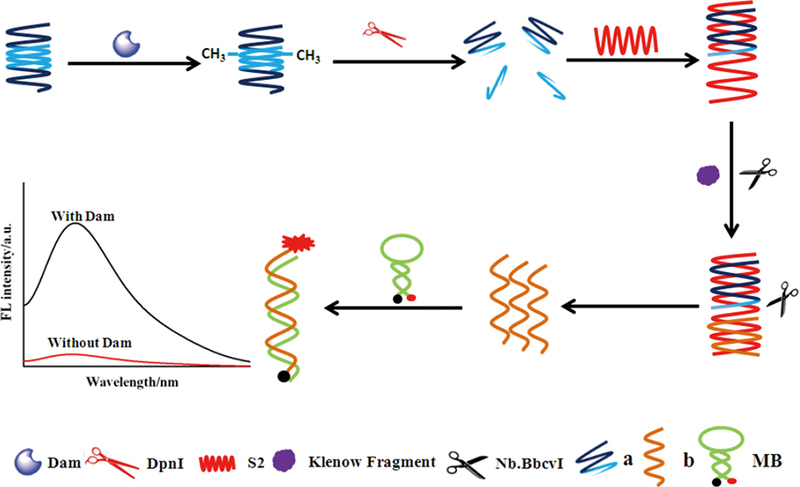 We also examined the distribution of proteins, such as bovine serum albumin, hemoglobin, and lysozyme, in the inner and outer phases through use of double capillary tubes with different inner diameters. The protein distribution was greater in the inner (dextran-rich) phase than the outer (polyethylene glycol-rich) phase. The distribution ratios of the three proteins (ratio of the inner/outer protein concentration) were 2.3, 4.2, and 1.8, respectively. The proteins concentrated in the dextran-rich phase through tube radial distribution flow of a polyethylene glycol/dextran mixed solution. DNA methyltransferase (MTase) is related to transcriptional repressor activity in biological functions. It is an essential for cancer diagnosis and therapeutics to detect DNA MTase activity sensitively. Here, a fluorescent system based on polymerase amplification has been developed to detect DNA adenine MTase (Dam) activity sensitively. The amplification is triggered by the probe DNA regions a, which are the primes of a polymerase-induced replicated reaction. They come from methylation and a digestion reaction of DNA S1-S1, including a 5′-GATC-3′ sequence recognized by Dam MTase and methylation sensitive restriction endonuclease Dpn I. The intensities of fluorescence are dependent on the Dam MTase activity. The method shows fine sensitivity with a detection limit of 3.2 × 10−4 U mL−1 and specificity for Dam MTase. In human serum samples, the method has been successfully applied, and it has also been used to screen the inhibitors, which means that the developed method can be a powerful and potential tool for drug development and clinical diagnosis in the future. Di(phenyl)-(2,4,6-trinitrophenyl)iminoazanium [DPPH] is widely used as a standard for measuring the number of free radicals. Here, we evaluated the number of free radicals of “DPPH” reagents from three manufacturers by effective magnetic moment method. Interestingly, the reagents from different manufacturers had varying temperature dependencies for both magnetic moment and g-value at low temperatures. As a result, the maximum relative difference among the three reagents on the number of free radicals per unit mass was 20%. 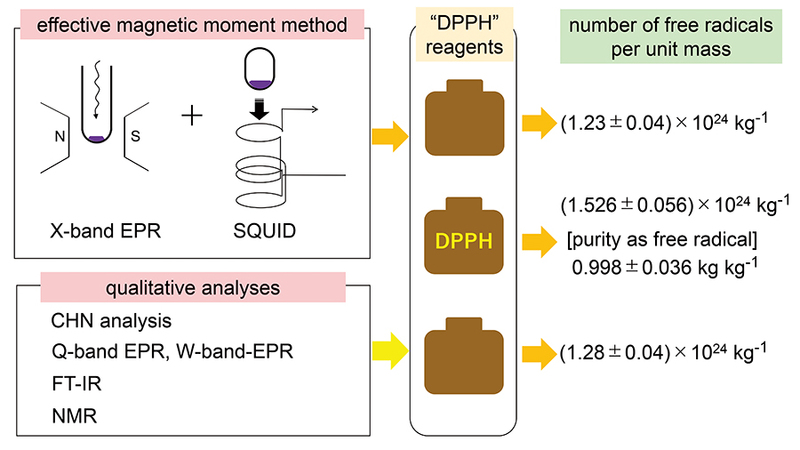 Carbon hydrogen nitrogen (CHN) analyses, high-resolution EPR measurements, FT-IR measurement, and NMR measurement confirmed that a major component of only one among the three reagents was “pure” DPPH. The evaluated purity based on free radical content was 0.998 kg kg−1 with expanded uncertainty of 0.036 kg kg−1. The other two reagents were found to be contaminated by several % of benzene in the DPPH crystal structure. The distribution constants of 4-benzoyl-3-phenyl-5-isoxazolone (HPBI) and deprotonated one (PBI−) between hydrophobic ionic liquid 1-butyl-3-methylimidazolium bis(trifluoromethanesulfonyl)imide ([C1C4im][Tf2N]) and aqueous phases were determined, together with the acid-dissociation constant of HPBI. 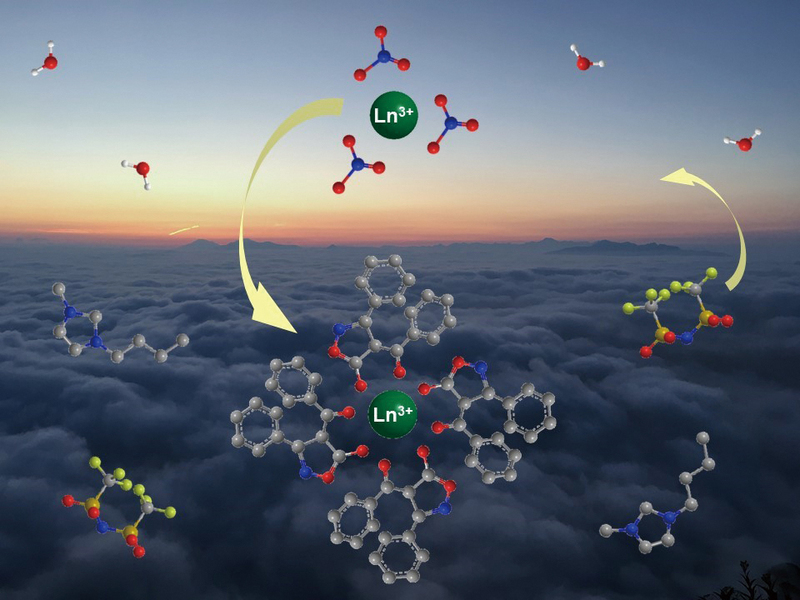 The solvent extraction of three selected lanthanoid ions (La3+, Eu3+, and Lu3+) with HPBI from aqueous nitrate phase into [C1C4im][Tf2N] has been investigated. Application of the ionic liquid as the extracting phase greatly enhanced the extraction performance of HPBI for lanthanoid ions compared with that in the chloroform system. A slope analysis was conducted in order to compare the results of the solution 4f-ion coordination chemistry in ionic and molecular media. The composition of the extracted species was established to be anionic tetrakis entities, Ln(PBI)4−, for light, middle, and heavy lanthanoid ions in an ionic environment (Ln denotes lanthanoid ion). Nevertheless, the typical neutral chelate lanthanoid complexes of the type Ln(PBI)3 have been detected when the conventional molecular diluent chloroform was applied as an organic phase. We have clarified the differences in the power-law between normal and corresponding cancerous cells from dynamic viscoelastic measurements in a frequency range of 102 to 105 Hz with a laser-induced surface deformation (LISD) microscope. From the differences in the power spectra at higher frequencies, it has been clarified that a normal cell obeys the power-law with a single exponent, while a cancer cell with two exponents, indicating that the plasma membrane in the cancerous cell has at least two layers with different viscoelastic properties. 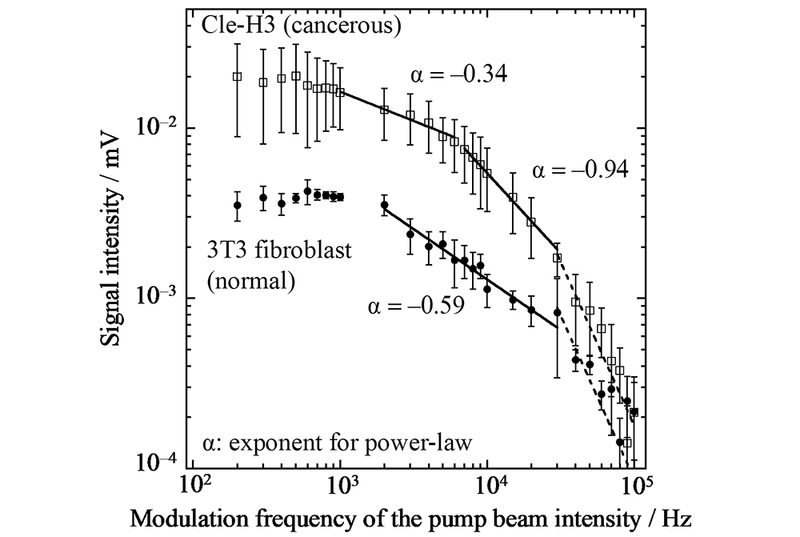 In LISD measurements, the extension of the upper limit of the applied frequency up to 105 Hz allows us to clarify the existence of the two power-law exponents in the cancerous cell. Understanding the differences between normal and cancerous cells from the power-law in addition to conventional elasticity would be useful for the identification of cancerous cells and for the construction of a mechanical model for their invasion.